My visit to the Georgia Aquarium last fall was an amazing and memorable experience. With its warm and welcoming atmosphere, outstanding exhibits and spectacular marine life as well as a chance at a behind the scenes tour what more could the Lady of the Zoos (and Aquariums) ask for? The Georgia Aquarium, located in the heart of Atlanta, Georgia is the largest aquarium in the world, home to more than 120,000 individuals of 500 species all in more than 10 million gallons of marine and fresh water. The aquarium boasts many once in a lifetime opportunities, with various touch tanks throughout the building as well as behind the scenes options including; a tour behind the scenes of the aquarium, a beluga whale interaction as well as “Journey with Gentle Giants“. If you’re looking to check a few experiences off your bucket list “Journey with Gentle Giants” is an astounding experience where you have the opportunity to swim and dive with some of the ocean’s most spectacular marine life including whale sharks, manta rays, sharks, groupers and many more. 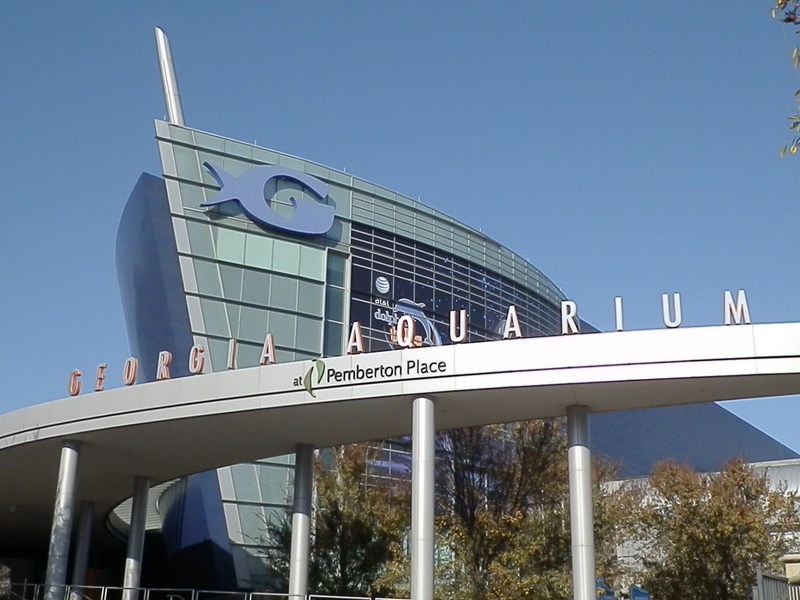 The Georgia Aquarium is a great place for adults and children alike. Whether you’re looking for a relaxing day wandering the aquarium’s exhibits, educating your young ones about the beauties beneath the water as well as how we can do our part to ensure safe waters for wildlife and humans alike, or a fun time at shows like “Deepo’s Undersea 3D Wondershow” or “AT&T’s Dolphin Tales“, a theatrical play where dolphins are the stars, the Georgia Aquarium has something plus more for everyone. So I hope you’ll join me as I take you beneath the magical mural on the entrances ceiling of playful belugas, friendly fish and other marine life and get drawn in to the wonders that lie within the Georgia Aquarium.